Road trips are a common summertime adventure, especially here in Colorado. With the Rocky Mountains located in our backyard, and all the other outdoor adventures that our beautiful state has to offer, setting out on a day trip or a long road trip is a cherished summer pastime. 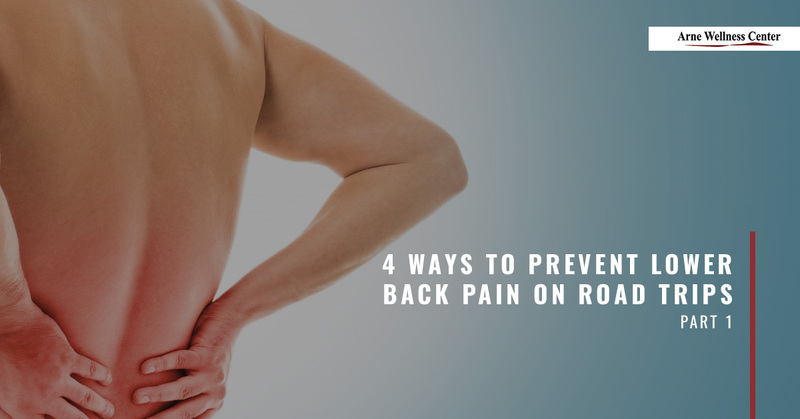 Unfortunately, driving and riding in cars for long periods of time can do a number on our backs, especially for those people already suffering from back pain. Below are four healthy habits you can practice before, during, and after a road trip to help prevent lower back pain. In the unfortunate case that you’re involved in an auto accident while on your road trip, we provide safe, effective auto injury treatment in Littleton. Give Arne Wellness Center a call if you would like to begin natural auto injury treatments, which may include chiropractic care, acupuncture, and massage therapy. Getting your body ready to perform different activities while on your road trip can help prevent lower back pain. Get into the habit of stretching your back, legs, and other muscles groups before your trip so that you can familiarize yourself with stretches. Stretching the muscle groups in your back and legs can help prevent cramping and strain from activities you’ll be doing on your trip. Drink plenty of water the night before you leave to ensure your body and muscles have a head start on the hydration they require to function. It’s important to drink plenty of water while driving, so before you head out, fill up water bottles and freeze them so you have lots of cold water to drink during your drive. This may mean more bathroom breaks while you drive, but stopping at convenience stores for road trips snacks and novelty items is all part of the fun! Car seats are not always the most comfortable, and they don’t provide the best support for your spine. Make sure to get a good lumbar support for your seat for additional back support that can reduce muscle tension, strain, and overall discomfort while your drive. While road trips are a ton of fun, being on the road for a longer duration increases your risk of being involved in an auto collision. Be a cautious driver who is aware of your surroundings and other drivers on the road. Make sure you are free of distractions while you drive, and always be prepared to drive in severe weather, which can strike at anytime. In the unfortunate case that you’re involved in an auto collision while on your road trip, give Arne Wellness Center a call when you get back into town to arrange a chiropractic consultation and begin auto injury treatment. Be sure to join us for part two of this short blog series to learn more ways to prevent lower back pain while on your summer road trip.